Anyway, today I wanted to talk about an experience I had with my kids a few weeks ago, one that caused me to reevaluate a few things. 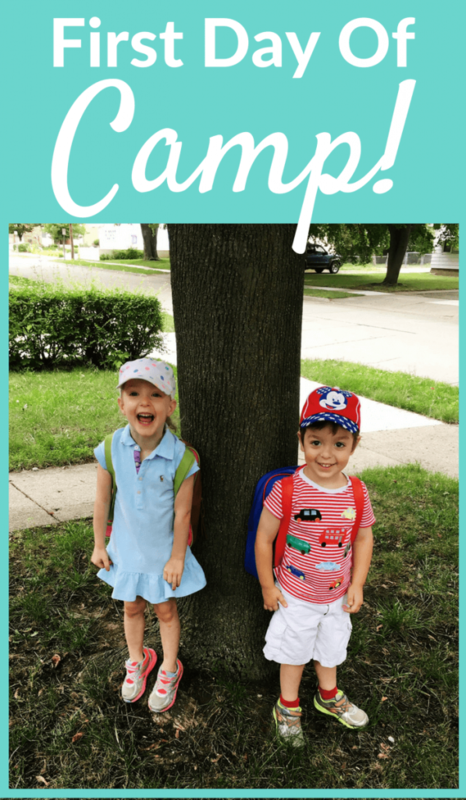 Over the summer, my kids had their first experience with summer camp. They went to two different camps, did a ton of crafts, took swimming lessons, tennis lessons, and more. They were having a great time until my daughter came home from camp one day and told me that someone named “Ms. Melody” hit her on the leg. She seemed adamant about it and was really upset, so I called the camp director. Unfortunately, there was no one working there by the name Melody, nor was there a child with that name at the camp. There wasn’t even someone with a name similar to that. So, it was really hard to get concrete answers. Thus far, our kids haven’t made up stories, but once we talked extensively with everyone at the camp, we couldn’t pinpoint exactly what happened. My husband even stayed awake after being on an overnight shift at the hospital to come with me to camp the next day to talk to the staff there. Anyway, it’s hard with 3-year-olds because they can talk but don’t really have the depth of language to fully explain things. To me, it was very unusual for her to say that out of the blue, but at the same time, she couldn’t point out a “Miss Melody” when her Dad and I walked into camp with her. We selected this camp for a particular reason because of their stellar reputation, and when we walked into camp to try to figure out the situation, they bent over backward to make sure my daughter was ok. In the end, we decided to keep sending her to camp because she didn’t seem to have any anxiety once we talked about the situation. She and her twin brother finished out camp happy and with lots of crafts and stories about nature walks etc. to bring home. Still, the whole experience kind of rocked my world for that week. Had I pulled my daughter out of camp, though, I would have lost around $100-$200 since the camp fee was nonrefundable. Clearly, her safety is paramount, and I would have taken her out of camp in one second had I felt she was in danger. But, she did seem okay in the end, and although I’ll never know exactly what happened, she does still talk about the camp in a positive way. Considering taking my daughter out of camp and potentially losing money made me think about kids who have to withdraw from school on a larger scale – like college. Lots of people focus on student loans as one of the bigger problems facing college students today, but there’s a quieter problem that people are finally starting to discuss. This problem is that there are many college students who are overwhelmed, stressed, and suffer from anxiety. Sometimes, this gets so bad that they have to withdraw from school. In fact, The National Alliance on Mental Illness did a survey of students who dropped out of school, and of them, 64% of respondents said they were no longer in school due to a mental health related reason. In related news, the folks at Allianz Tuition Insurance recently released the Allianz Tuition Insurance College Confidence Index which indicates that nearly half of America’s college age students anticipate the need to withdrawal. That’s not only a lot of people but a lot of tuition money that could be lost if families don’t understand their institution’s refund policy. In fact, 85 percent of parents agree that the financial implications of college withdrawal could be severe, thus impacting their daily life and their child’s ability to one day return to school. Then, there are other reasons kids withdraw from school, like to take care of a sick family member or to go home if they have a serious illness of their own. Sometimes, they determine that a particular program or school just wasn’t the right choice for them. It’s disappointing to think of the financial repercussions that can accompany a withdrawal on this scale. Our twins’ safety will always come first, but my husband and I were hesitant to lose a few hundred dollars and we can’t imagine being out thousands. Obviously, you can’t prevent your child getting sick, but I think we can reduce some of the other reasons for school withdrawals by having a lot more open conversations with our kids. So, I wanted to list out a few ways parents can talk to their kids before the school year begins to help keep the lines of communication open whether you have a kid in grammar school, high school, or college. Set your expectations: It’s good to have high expectations of your kids but not so much that they wake up stressed every day. Tell them you expect them to attend class and try their best. Tell them to let you know if they are having trouble with a particular class. Sometimes kids get stressed and don’t want to talk to their parents about their problems for fear of disappointing them. How you handle their setbacks will determine how much they will confide in you in the future. Stay in their business: Once your child is in college, they are technically adults. However, they don’t have the full responsibilities that adulthood brings. So, stay in their business. Ask what they’re doing. Ask who they are spending time with. The more you know about them, the easier it will be to tell if they are withdrawn, ill, unhappy, or uncertain about their choices. Protect your investment: If you do have a student heading off to college right now, consider buying tuition insurance. This protects you financially in the event your child does have to withdraw from school. Ultimately, my experience with my kids this summer only gave me a small taste of the type of stress that comes with having school age children. My kids have a long way to go before they head off to college, but I know I’ll be working hard to ensure that they are safe, happy, and adjusted in every school they attend from now until then. Have you ever had to take your kid out of a particular school, camp, or extracurricular activity? What was your experience like, and why did you do it? Did you suffer a financial loss because of it? FTC Disclosure: This post was sponsored by Allianz Global Assistance (AGA Service Company), and I received financial compensation for it. All opinions and stories mentioned here are my own. The lower your cost, the lower the debt burden, so start researching and talking about college expenses well before it’s time to apply.You’re going to find some colleges that are very reasonable. Some might have more generous aid policies, or cheaper pricing for in-state residents.